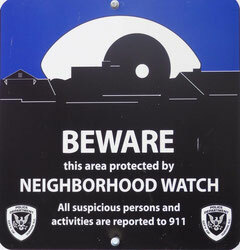 Formed in 2009 and sponsored by the Alliance and the Durham Police Department, the Falconbridge Neighborhood Watch (NW) is one of several similar organizations in Durham whose aim is reducing and preventing crime. Our neighborhood enjoys excellent service from the police: rapid response times (often two to seven minutes), frequent random patrols by marked and unmarked police cars, and support and encouragement at all our meetings. Officers have permission to use our Clubhouse at all hours. We take pride in the fact that our efforts are routinely cited as the model for all others in the city and may be responsible in part for our lower crime rate. Daylight break-ins do, however, occur in the neighborhood, sometimes perpetrated by individuals posing as solicitors and itinerant workmen. Continued vigilance is warranted. The sole function of NW is to watch for suspicious persons, vehicles and activities and then to report those to the police and participating neighbors. It is NOT a vigilante organization, but a well-organized communications network of observant neighbors who seek to keep Falconbridge free of crime. To reduce the likelihood of violent confrontation, NW strongly discourages anyone who holds a “concealed carry” permit from serving as a Block Captain. For more information, contact Greg Yates, the Falconbridge Neighborhood Watch Coordinator, at 919-704-0736 or FalconbridgeNW@yahoo.com. You may email the completed form to him or deliver it to 6606 Huntingridge Dr.
Due to our involvement in Neighborhood Watch, all homes and townhomes in Falconbridge are eligible for a Security Assessment. A Crime Prevention Officer from the Durham Police Department will conduct a walk-through of your residence to determine strategies to lessen your property’s “curb appeal” for the ‘”would be criminal.“ These Security Assessments focus on physical, electronic and procedural security and the new Crime Prevention through environmental Design (CTPeD). After review, you will receive a typed copy of the assessment with specific recommendations. Contact our District 3 Community Resource Officer Lawanda Mock, lawanda.mock@durhamnc.gov or call 919-560-4404 x29417 to schedule your Security Assessment. Did we mention this Security Assessment is Free of charge? Another great reason to be part of the Falconbridge Neighborhood Watch! Questions - contact Greg Yates, NW at FalconbridgeNW@gmail.com. Looking for your Neighborhood Watch Block Captain?